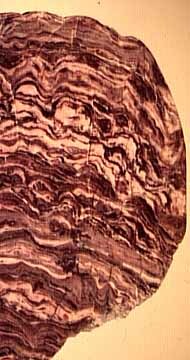 Stromatolites are the oldest known fossils, dating back more than 3 billion years. 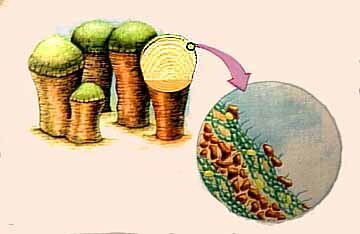 They are colonial structures formed by photosynthesizing cyannobacteria and other microbes. 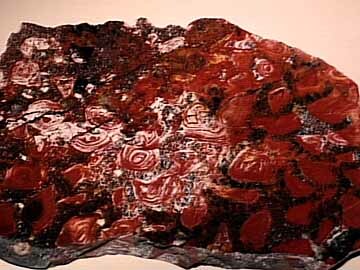 Stromatolites are prokaryotes(primitive organisms lacking a cellular nucleus) that thrived in warm aquatic environments and built reefs much the same way as coral does today. 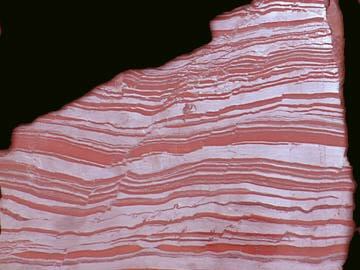 Cyannobacteria were likely responsible for the creation of earth's oxygen atmosphere. They were the dominant lifeform on Earth for over 2 billion years. Today they are nearly extinct, living a precarious existence in only a few localities worldwide. 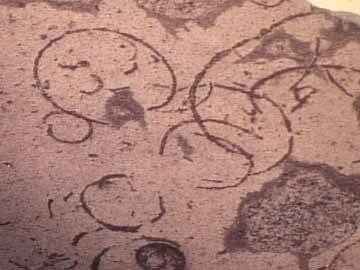 Possibly the oldest eukaryotes, ~2 billion years old. Copyright 1999 by Pan Terra Inc., PO Box 556, Hill City, SD, USA 57745.